Each mission in the game has various requirements for getting 100% completion and they don’t tell you what these requirements are until after you’ve finished them for the first time. Luckily we will show you the requirements here to help you out since we are nice like that. Note that restarting a checkpoint via dying or failed objective will typically void any accuracy percentage or time limit goals. You will end up with a CHECKPOINT for time and will have to restart the entire mission for the Gold. We will be adding to this as we learn more about the game. Pimp My Sidearm – 10gs – Fully mod a weapon. You can do this at any Ammu-Nation store. There are at least 9 of these on the map and they show up as guns. The cheapest upgrade is the Pistol at a total of $2,781. You need to buy 4 upgrades. Extended Clip ($387), Flashlight ($472), Suppressor ($1,822), and one of the tints. Army tint is cheapest at $100. This achievement / trophy is for getting eaten by a shark. Easiest way is to head to the pier and take a boat or jet ski out into the ocean. The sharks will show up on your radar as a red dot since they are hostile. When close to one, simply dive into the water and let that shark take a nice big bite out of your body. Getting a knife before hand is helpful as you need to provoke the shark into attacking you. Unlocked. Kifflom! – 30gs – Complete your path to enlightenment… or not. This is a cool series of Stranger & Freaks missions for Michael. Check out our video for a complete walkthrough of this quest line. Career Criminal – 100gs – Attain 100% Game Completion. 69 missions, 42 (of 59) hobbies and pastimes, 20 (of 58) strangers and freaks, 14 (of 58) random events, & 16 miscellaneous. You can got to socialclub.rockstargames.com to track your progress. For the 100% you only need to complete the ones with the bar on the side of the pic. From Beyond the Stars – 15gs – Collect and return all spaceship parts. There are 50 of these Spaceship Parts. They do not spawn on the map until you get the “Far Out” Strangers & Freaks mission for Franklin. Any character can pick them up once the mission has activated. We have a full completed video guide right HERE. A Mystery, Solved – 15gs – Solve the mystery of Leonora Johnson. There are 50 Letter Scraps. These are ready to go right when you start the game. After getting all 50 Franklin will get a Stranger & Freaks mission to complete. We have a full video guide HERE. The ability to buy property is unlocked after a few missions and then more and more properties will be available to you as the game progresses. To buy something simply head to it’s location and there will be a large for sale billboard. Walk up to that and it will tell you the price and potential earnings for the property. TP Industries Arms Race – 10gs – Purchase McKenzie Field Hangar and win the arms race. McKenzie Field Hanger is one of the first, if not the first, property you can buy as Trevor. All’s Fare in Love and War – 10gs – Purchase Downtown Cab Co. and complete a private fare. Downtown Cab Co is a Franklin property and costs $200,000. Once purchased you will receive phone calls on your cell phone to pick up private fares. Complete one of these for the achievement / trophy. Waste Management – 15gs – Purchase the old dock and collect all nuclear waste. There are 30 barrels of nuclear waste you need to clean up. Welcome to Los Santos – 10gs – You repo’d a car and raced it through the heart of a sun-soaked metropolis. This is the opening achievement for finishing the very first section. Diamond Hard – 20gs – You cleaned out Vangelico to pay back Martin Madrazo. A Friendship Resurrected – 10gs – With friends like this who needs enemies? There are a total of 50 Spaceship parts to find in Grand Theft Auto V. This mission is started by Franklin in the Strangers & Freaks mission Far Out. You can get this by playing as Franklin after everyone is back from the first main heist. (Trying to stay spoiler free here). 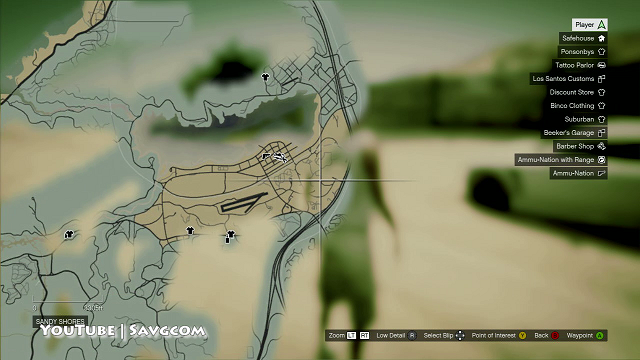 The missions starts in the upper section of GTA V’s map. CURRENTLY FOUND: 50/50 – All Found, All Recorded! There are 50 Unique Stunt Jumps in Grand Theft Auto V. Not only do you have to find them but you need to be successful in the jump. These are the ones we have found. This page covers as our Collectibles guide for the Letter Scraps in Grand Theft Auto V. These are available right at the start of the game and finding all 50 opens a quest to solve the murder. So there are a total of 57 “random” encounters in GTA V of which you need to complete any 14 for the 100% completion. These are actually not random at all. They all have set locations and set characters to activate. This page will serve as a guide as to where these encounters spawn on the map and the potential profit rewards for doing them. 69 missions, 42 (of 59) hobbies and pastimes, 20 (of 58) strangers and freaks, 14 (of 57) random events, & 16 miscellaneous. You can got to socialclub.rockstargames.com to track your progress. For the 100% you only need to complete the ones with the bar on the side of the pic.